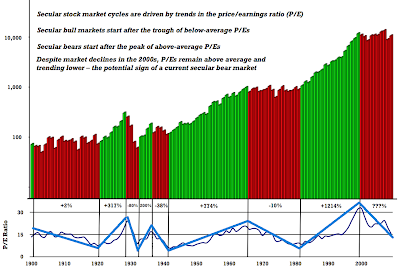 Is It Time to Scrap the Fusty Old P/E Ratio? Hence, a falling P/E ratio is not indicia of its lack of utility. Nor is it proof of “Fustyness.” Rather, it suggests that crowd is still feeling burned by the recent collapse in prices and increase in volatility. Thus, this is not about the market’s economic concerns, or sustainability of earnings. It is about psyche. Stocks are simply financial instruments—a payment today for the right to future cash flows.（略）The level of return is determined based upon market rates (driven by expected inflation) and the probability of losses. For this discussion, let’s eliminate the impact of a change in inflation and the probability of losses…so it only leaves the future cash flows. For stocks, the future cash flow stream (over the longer-term) is driven by economic growth. Therefore, if economic growth slows, the future cash flows (i.e. dividends from earnings) from stocks also are reduced. The impact on stock market valuations—if we have down-shifted to 2% real economic growth—is a drop in the average P/E of about 6 points. As a result, the average would decline below 10 rather than the historical 15 (assuming a repeat of historical inflation cycles). The natural peak during periods of low inflation would be below 20 rather than near the mid-20s. Few economists, financial analysts, nor this author conclude that this has occurred, yet with the uncertainty of the expected future real economic growth rate, this issue should be better understood.